Watch this video to learn more about our Granite countertops repair & restoration. On a scale of formica to granite, your countertops used to top the elegance chart. But then cracks, chips, or an overall dull appearance reduced your granite countertops to unimpressive. Fortunately, Stone Makeover can make your granite stunning once again. Working with granite, one of the hardest types of natural stone, is tricky. In fact, many stone restoration contractors won’t touch it. When your granite needs repair and restoration, you need a company that has the specialized knowledge and skill to achieve the results you want. 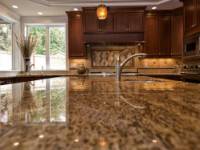 Stone Makeover can restore your granite to a like-new condition. Our highly-trained technicians have the hands-on experience resolve virtually any problem you may have. Whether your granite needs to be diamond honed, re-polished, or cleaned and sealed, we can perform these services for you. We can fix chips, cracks, unsightly seams, and remove most stains on countertops, vanities, and table tops. The key to keeping your granite looking new is the proper cleaning, polishing and sealing of the stone. Granite doesn't etch as easily as marble, but it is still important to be careful with acidic substances. If a spill occurs, wipe it up immediately and then clean with a quality neutral stone cleaner. Download our free Stone and Tile Care Guide for more information on caring for and cleaning your granite. For granite countertop polishing and other granite repair and restoration services throughout the NY and NJ areas, contact us online or call (800) 661-7866 today!